Pumpkin pie may be part of your holiday tradition, but after taking a peek at these cute Thanksgiving treats, your Thanksgiving dessert table may have a whole new look! 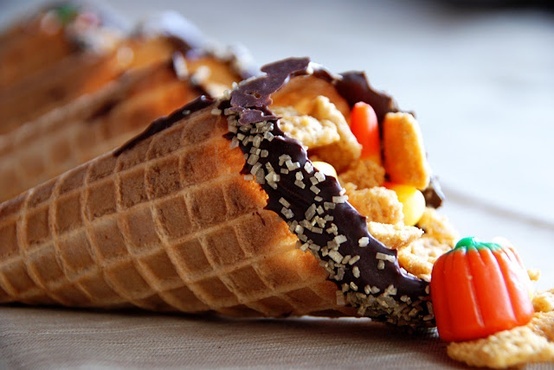 From corn waffles to marshmallow pilgrim hats, you'll fall in love with these fall desserts. 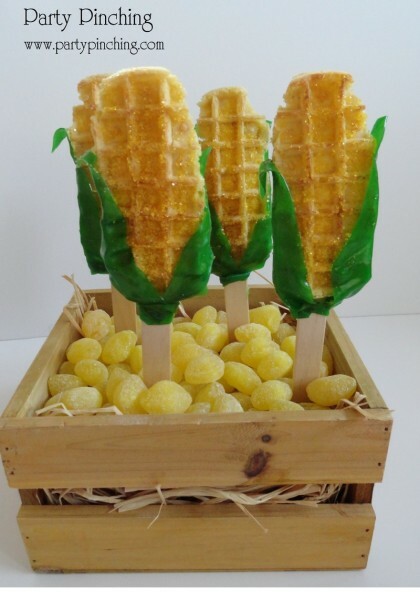 Start your Thanksgiving Day off right with these adorable corn cob waffles from partypinching.com that are sweet enough for breakfast or dessert! Cut toasted corn stalks into ovals with kitchen shears. Brush with maple syrup and sprinkle with yellow sugar sprinkles. Push an ice pop stick in the bottom of your waffle and wrap it with green fruit leather rolls for leaves! When you serve up a customizable snack mix in a cute Thanksgiving-themed cornucopia by crazyhousereviews.com, guests young and old will both be delighted by this easy yet adorable Thanksgiving dessert. First, melt chocolate in the microwave and dip the opening of your waffle cone into the chocolate. Immediately sprinkle on or dip in colored sugar or sprinkles. Set aside on waxed paper. Next, combine the remaining ingredients in a large bowl to form your own snack mix, which you can add in or leave out your family's favorites. 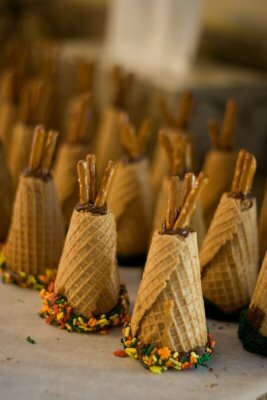 Finally, fill your waffle cones with the snack mix and serve on their sides in a horns-o-plenty style for a cute Thanksgiving treat that is sure to please a crowd big or small. Turn your idea of cupcakes upside down with these adorable Thanksgiving teepee cupcakes by stiesthoughts.com. First, get a disposable aluminum baking pan. Turn the pan upside down and poke a few small holes (maybe 1/2-inch wide). Then, mix a cake mix according to the package directions and fill your sugar cones 2/3 full of batter and stand them up in the holes in your pan. Bake at 350 degrees F for 10 to 12 minutes, or until the batter springs back lightly when touched. Keep an eye on them as they tend to topple over as the batter rises. Remove from the oven and immediately snip off the bottom of the sugar cone (which will now become the top of our teepee). You must do this immediately when the cone is still warm and soft. Otherwise, it will break into pieces. You can also snip off the cupcake if it's too rounded, ensuring that your teepee will stand flat. Break pretzel rods in half and stick 3 of them on the top of your teepee. Melt a handful of chocolate chips in the microwave and stir until smooth. Dip the bottom of your teepee in the chocolate. Then roll it in green sprinkles for grass (or autumn leaf sprinkles for leaves). Take a little of the melted chocolate and pipe around the pretzels to hold them in place and serve! 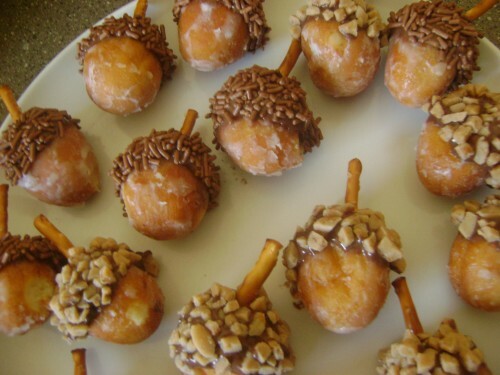 You won't find a cute fall dessert easier than these sweet acorns by graciousrain.com — the toughest part is keeping hungry hands away from them until it's time to gobble them up! First, dip 1 end of your donut hole into the Nutella. Next, roll the Nutella end of your donut hole in toffee bits or chocolate jimmies. Then, break 2/3 of a piece of pretzel stick off and stick it into the top of your dipped and rolled donut hole to form a stem. Believe it or not, your quick and easy fall dessert is ready to serve! 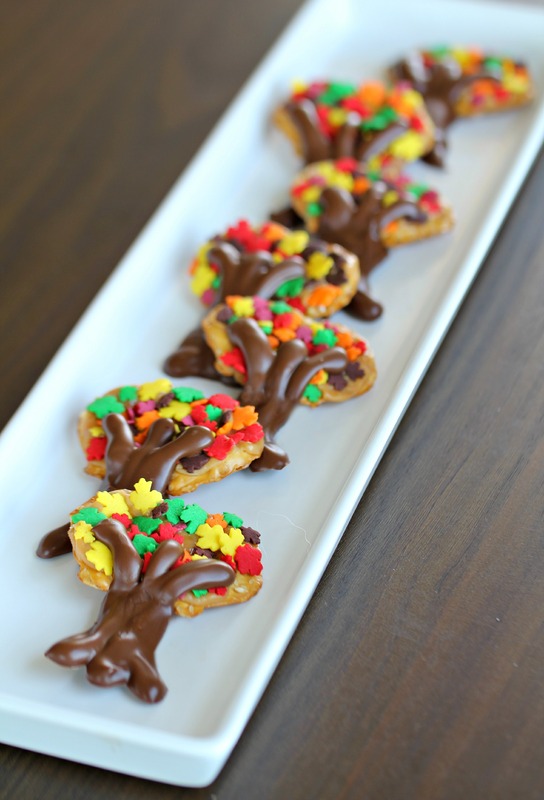 Meld sweet with savory this Thanksgiving with these pretzel trees from the Pretzel Crisps® blog, Fresh Out of the Oven. Photo credit: Jasmin Fine, 1FineCookie.com. Melt caramel chews on Pretzel Crisps in the microwave for about 25 seconds. Press leaf sprinkles on top. An alternative is to spread on frosting and shake sprinkles on top. Melt chocolate and drizzle a trunk across the bottom of each crisp. Allow to harden and serve. Fudge-striped cookies topped with chocolate-dipped marshmallows make these Thanksgiving hat treats by fabulesslyfrugal.com a guaranteed hit at the Thanksgiving dessert table. First, turn fudge striped cookies upside down. Then, dip marshmallows in melted chocolate candy coating and set them on top of the cookies. 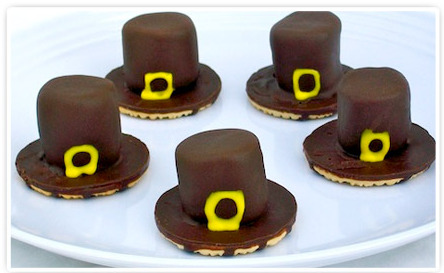 Once the chocolate has hardened, draw a buckle on the base of the hat with yellow icing. You could also stick an M&M right there while the chocolate is still soft. 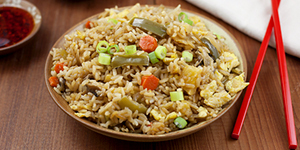 So easy, so yummy!